The United States pursued and cracked down on Iran's efforts to fly the cash out of Germany immediately, officials confirmed. "The Mahan Air flights were part of that effort to crackdown on Iran's malignant activities abroad," one official told the Free Beacon, speaking only on background about the sensitive diplomacy. "Shutting down the cash transfer last summer and shutting down Mahan Air" were two pressing goals for blunting Iran's malign activity. 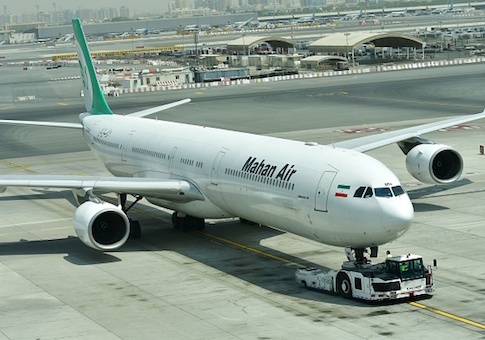 "Mahan Air was being squeezed from every angle," the official explained, disclosing that this is part of the Trump administration's larger policy of choking off the Iranian regime through packages of sanctions and other measures. As part of the behind-the-scenes effort to put the squeeze on Iran, U.S. officials and others also took a close look at Assadollah Assadi, an Iranian diplomat extradited from Germany for his alleged role in a recent plot to bomb Iranian opposition leaders. Multiple U.S. government agencies "were very suspicious" of Assadi's alleged links to a bomb plot on European soil, sources said. Germany's decision to ban Mahan received public approval from top U.S. officials, including Secretary of State Mike Pompeo and Richard Grenell, the U.S. ambassador to Berlin. The praise is said to be a sign the United States is working behind closed doors to spread the ban on Mahan across Europe. "We are thankful for German leadership to shut down Mahan Air," Grenell tweeted. "The safety of German and U.S. citizens is the highest priority." "The U.S. welcomes Germany‘s decision to deny landing rights to Iran‘s Mahan Air," Pompeo tweeted earlier this week. "The airline transports weapons and fighters across the Middle East, supporting the Iranian regime's destructive ambitions around the region. We encourage all our allies to follow suit." Sources familiar with ongoing diplomatic efforts said that pressure is now being applied to France. The national security implications of allowing Iran unfettered air travel are becoming more clear, sources said, pointing to Iran's ongoing shipment of militants into regional hotspots, as well as its reliance on illicit funding networks tied to terrorists.